Thailand's political situation is really hard to grasp, unless you've been living in Thailand long enough. Let me see, back in 2006 Thaksin got ousted in a coup lead by the military, then the Yellow Shirts through mass protests and questionable means brought down the replacement prime ministers that they didn't like. 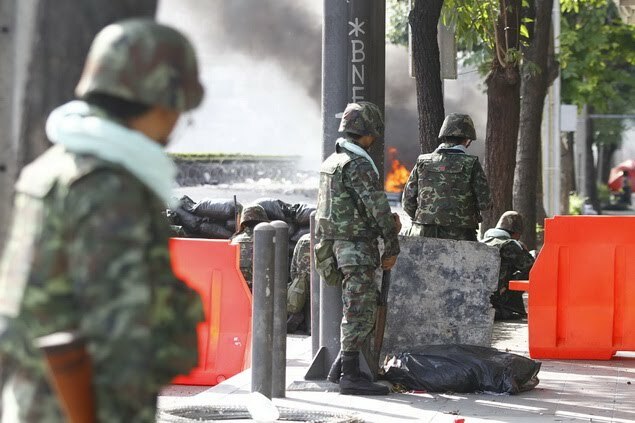 Of course, this brought the UDD, aka The Red Shirts, or Thaksin-supports to start their own protests in the streets. After all, if they could do it, why can't we? As usual, the media coverage is all about how the Red Shirts are destroying the country and nothing about the reason they're holding the protest. Personally, I think the Red Shirts picked a bad name. Since most of the Thai media are utterly biased against either the red or the yellow, I choose to follow BBC News. Imagine having to read news from a website across the world on what's happening on my doorsteps. Anyway, since it's like a war zone out there almost right outside of my office so I better head home. I'll fix my servers another time since if any of the fighting happens to blow up my office by mistake, I would've saved time by not fixing my servers!